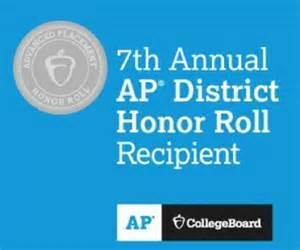 The Advanced Placement District Honor Roll was released by College Board earlier this week and Seneca Valley School District has once again been named as a recipient. The seventh edition of the annual has honored only 433 schools from across the nation (and Canada), keeping Seneca Valley in rather distinguished company. The Honor Roll focuses on schools that have improved upon not only test scores but also quantities of students enrolled in AP classes. To make it onto the reputable list of progressing schools, Seneca Valley had to increase the amount of AP students while also simultaneously maintaining a certain average test score, according to Seneca Valley’s official website. Completing both tasks is not easy for any school, especially for schools that are home to minority students. Statistics from this year alone show that approximately 50 percent of underrepresented students with a high degree of readiness for AP are participating in the program”, according to College Board’s AP Central. Seneca Valley was able to increase its percentage of exams taken by students of African American, Hispanic, or Native American descent. Giving students who deserve access to these classes and eventually tests is one of Seneca Valley’s biggest goals when it comes to Advanced Placement. The school district’s official website describes its involvement as “committed to expanding the availability of AP courses among prepared and motivated students of all backgrounds”. The fact that Seneca is such a large school district is also a testament to how much its Advanced Placement enrollment has improved. “Large” schools had to increase enrollment in AP classes by at least 4 percent since 2014 in order to be considered for the Honor Roll. The rather exclusive list of AP Honor Roll recipients features only 44 schools from the state of Pennsylvania. Other schools that made the cut, that also happen to be “rivals” of Seneca Valley, include North Allegheny School District and Fox Chapel School District. A whopping 426 schools come from the U.S., meaning that only 9 of the schools on the list are in Canada. Earlier this year, College Board released its list of AP Scholars and one hundred Seneca Valley students made that list. This list of extinguished students, especially when combined with this latest iteration of the AP District Honor Roll, shows just how skilled and prepared for college Seneca students really are. AP scores, especially those that are above 3, are received by colleges all over the world. Over 4,000 colleges and universities accepted scores in 2016, and that number is only expected to increase in 2017. Seneca is certainly expected to stay ahead of the curve yet again.